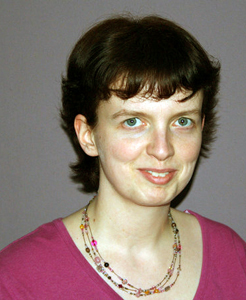 Yvette Hoitink is a professional genealogist in the Netherlands. Her company, Dutch Genealogy Services, specializes in helping people from all over the world find their ancestors in the Netherlands. Most of her clients are descendants of emigrants who left the Netherlands in the 19th and 20th century but she also helps people find their New Netherland roots. Her services include doing research, interpreting documents for English- speaking clients, preparing visits to places of origin for clients and giving lectures. Genealogy has been her favorite pursuit for over twenty years. Yvette started doing genealogy in 1991, when she was just 15 years old. Two years later, she created the first genealogical website in the Netherlands (probably one of the earliest in the world). This got her in touch with descendants of Dutch emigrants all over the world, which made her realize how many people were searching for their Dutch roots. Yvette studied Computer Science and Management Studies at the University of Twente in Enschede, the Netherlands. For ten years, she and her partner ran an IT company that specialized in consultancy and custom software for cultural heritage organizations, working for archives and libraries throughout the country. Since 2006, Yvette has worked for the Nationaal Archief, the National Archives of the Netherlands, where she currently works part-time as a project manager in the IT department. Through her own company and her job at the National Archives, Yvette has been involved in the development of the largest genealogical websites in the Netherlands so she has been a genealogy professional for over fifteen years. She started taking clients two years ago. Yvette Hoitink writes about Dutch Genealogy on her blog (in English) and her weekly newsletter and has a column in Gen, the quarterly magazine of the Centraal Bureau voor Genealogie [Central Bureau for Genealogy, the largest genealogical repository in the Netherlands]. Together with Jeroen van Luin, she wrote Internet bij Stamboomonderzoek, a successful book about internet genealogy. She also gives lectures in Dutch and English about topics such as Dutch genealogy, 19th century emigration, internet genealogy and local history. Yvette Hoitink talked about how she had researched her father’s entire village and how many of the residents had emigrated to America. She has put all the information online for free on her website. Not only does it provide valuable information for people looking for details on that village but it also drives people searching for Dutch ancestors to her website. While they are there they learn that Yvette is a genealogy professional who can help them with their research. Providing valuable free content on your website is a great way to attract new visitors to your site. For this week’s action item think about what valuable information you can provide for free to drive people to your website. Perhaps you are an expert in an ethnic genealogy group or in a geographic area (like Yvette). Can you provide content on your website that would be valuable to a first time visitor and would also demonstrate your expertise? Your action item for this week is to think of some valuable information related to your niche that your can share on your website which new visitors will find via search engines. If you are feeling very ambitious go ahead and put it on your site and then wait a month or so to see what kind of results you get. Make sure that people can easily see that you provide research services on the same topic!